I then added 1 tablespoon of the above concoction to one litre of water and sprayed all the leaves once a week for four weeks. The concoction proved unsuccessful and the leaf miner still rules supreme! In fact, my garden is proving to be a real haven for all types of bugs and diseases and treating them is like trying to climb a greasy pole. Attempting to grow my own fruit and vegetables in containers and in my little raised vegetable area is proving to be quite a challenge and battle of wills. Thank goodness for my tenacious spirit! The lettuce and corn salad seeds, planted in early August, despite my devoted attention to their needs failed to germinate. Bah humbug! Eventually I conceded defeat and purchased some lettuce plugs from the local market. My other purchases included a couple of sage plugs and cucmbers for 10cents each, and dare I say one zucchini. The stallholder laughed at my requests and I responded a Portuguese shrug and a smile. The poor guy has long since given up hope of selling me the normal minimum quantity of ten plants per variety. On a positive note, my successes in August included: one orange and several red peppers, french beans, cucumbers, lettuce, cherry and plum tomatoes, chili peppers, lemons and some strawberries. August merged seamlessly into September, the drought continued and the bugs, despite my best efforts continued to thrive and multiply. The latest visitor to take up residence bored its way into several of the tomatoes, growing in pots. Once discovered I quickly disposed of these and then wished I’d cut open one of the tomatoes to discover who had moved in. I’m still none the wiser as to their identity – any clues please? The cherry tomatoes, both in pots and in the raised bed yielded an abundance of sweet ripe tomatoes. However, the variety (breed unknown) shown here, just refused to ripen. I even placed banana skins close by, to encourage the ripening process. Well that was a waste of time as the banana skins eventually shrivelled to nothing and my tomatoes were still a yellowy-green. Patience is not always my strong point so I picked several pounds of the greenest tomatoes and made green tomato chutney. If it’s successful I will share the recipe at a later date. On impulse I bought a packet of seeds labelled something like “mixed salad leaves” Yay! these did germinate and resulted in an interesting, if not strange tasting assortment of salad leaves to go with the lettuce. 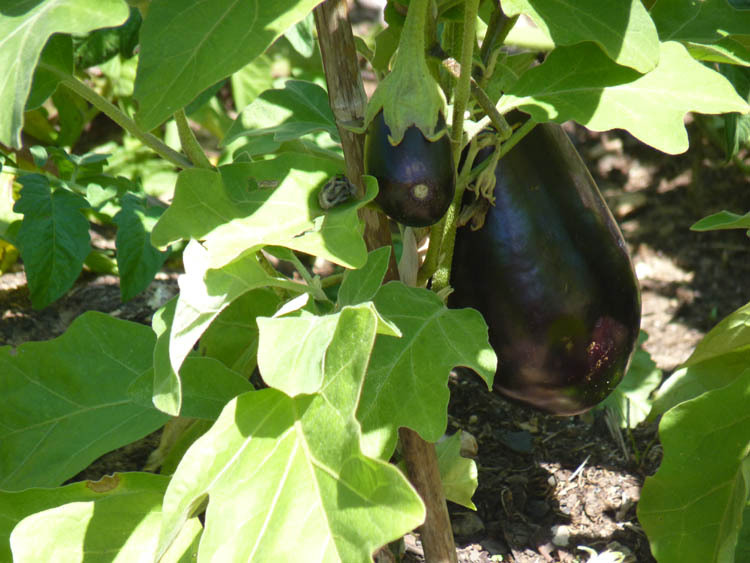 The first crop of aubergines from the plugs I planted on the 16th of June are now ready for harvesting. A quick snapshot of my raised veg garden below reminds me the parsley which self seeded survived the summer and continues to grow well. Why do seeds grow best where they self-seed? The leeks planted in June have struggled for survival during the hot dry summer months. They’ve survived but they resemble oversized spring onions rather than leeks. 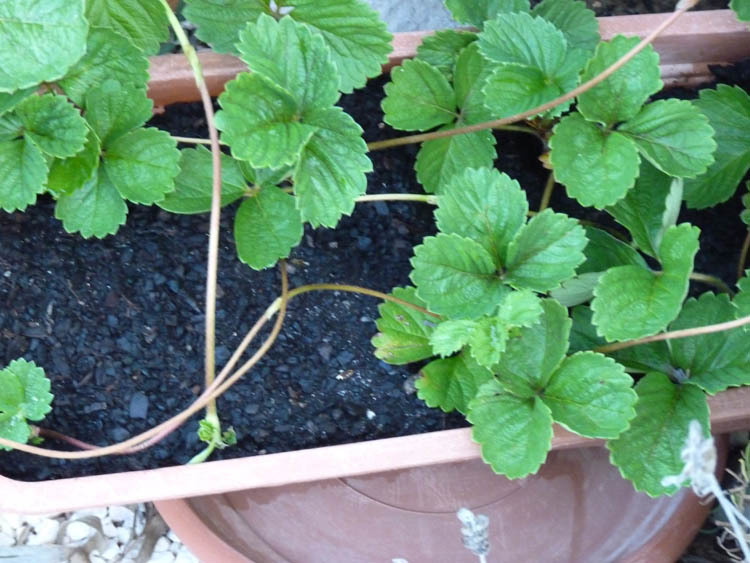 My strawberry supply ceased in early September and the established plants sent out runners which I potted up while they were still attached to the mother plant. 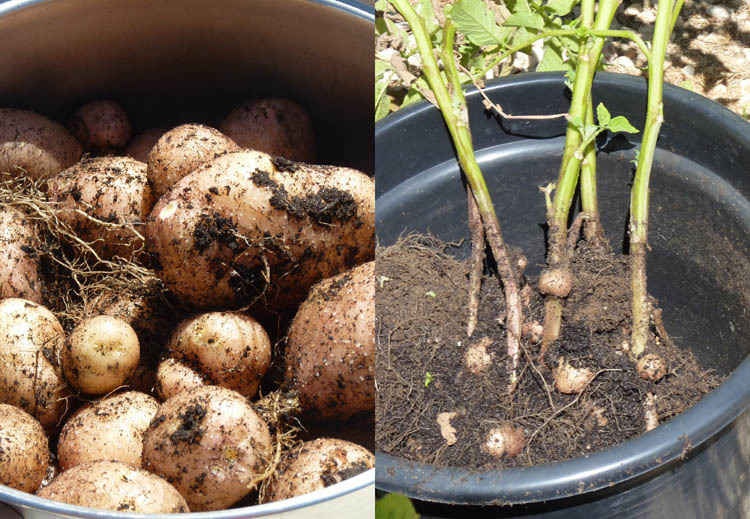 I planted potatoes in pots on the 24th of June and we harvested the first pot (enough for two servings) beginning of September. 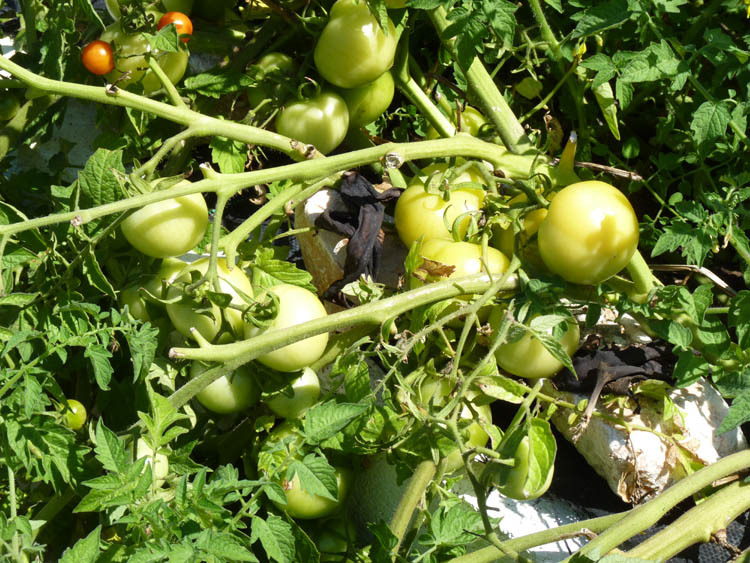 I felt really pleased with myself until I discovered that you should not plant potatoes and tomatoes near each other because they are both prone to blight. 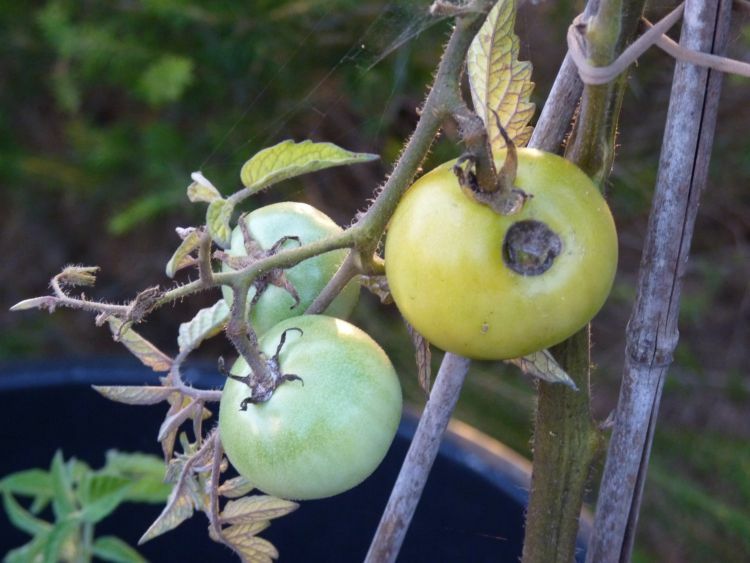 I later identified one of my potato plants had blight, which in turn spread to several of my tomato plants which then had to be destroyed. 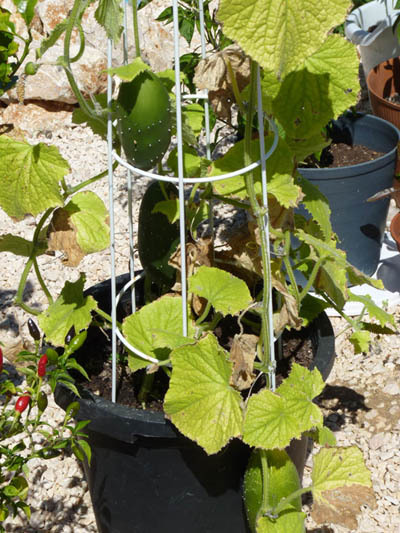 I have a couple of pots of cucumbers and apart from battling with Downy Mildew or Anthracnose the cucumbers are delicious! Blogger, Growing Up in the Garden , suggested keeping downy mildew at bay with a 50/50 milk/water solution. 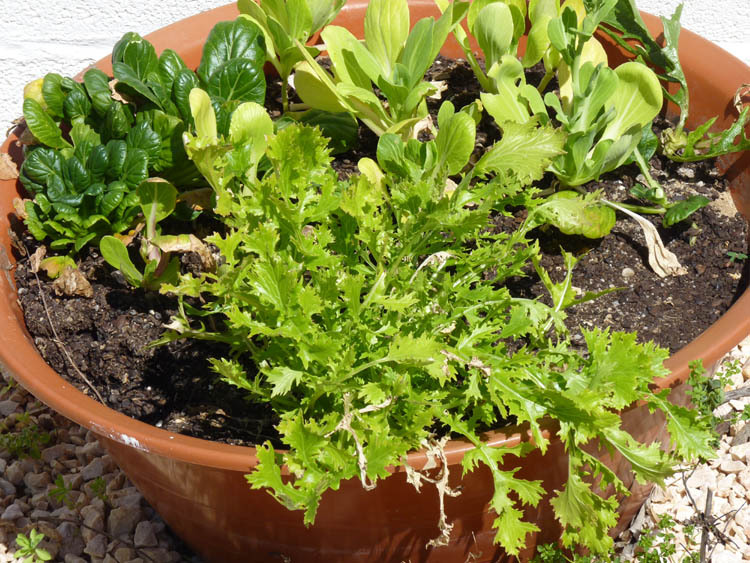 Use a spray bottle to apply solution to the leaves, removing those that are too far gone. So far so good and it has definately helped. I also planted a couple of baby cucumber plants in the hope I can continue to grow my own cucumbers in a sheltered position during the winter; we will see! Overall considering August and September were so dry and hot they proved quite productive. However, next year I will not grow orange peppers as they take far too long to fruit and then turn orange. I love how you have your garden set up. There is certainly never a dull moment with gardening! I had no idea growing things was so complicated, but the results look great. I’m sure hoping my pot has potatoes like that. Giving it all the time I can. Hi Alice, I just waited until the foliage died down, because I figured if there was not much foliage, there would be no more nutrients going to the potatoes. It was purely an experiment and I’m already chitting some more potatoes ready for the next batch 🙂 Good luck with yours! I don’t know whether to congratulate or commiserate. Growing fruit and veg does seem to be very hard work. The plants which have survived your uninvited visitors attention do look great and I am sure are worth the effort. Hi Clara, to be honest, sometimes I’m tempted to give in. But when I taste the produce any doubts are put behind me! That’s interesting because I have never planted potatos in the pot. Hi Coco, neither had I! Great to read about your wide variety of ‘stuff’ growing! Yes, I have had citrus leaf miner also: sometimes have ‘caught it’ when just a few leaves affected and simply taken those off. At other times use a mix v much like yours. I always buy seedlings in punnets, rather than seeds – v little luck with those too ;( ! [oh, you seem to call them plugs; someone in the US also said they had to look up ‘punnet’?] Wonder whether some of your salad mix may be of Asian origin; the darker ovoid green look rather like tatsoi to me ? Hi Eha, when I buy pugs they are single baby plants. I used to call them seedlings, but then this could refer to a punnet of baby plants. Do you have a blog Eha? the elaf miner is a real pain. I’m going to really blitz them now I’m back as the poor little lime tree is really struggling – thank goodness it’s a fiesty little tree. Thanks heaps for your reply! No, for rather practical reasons at the moment I do not post myself, but land like a cuckoo in other bloggers’ nests hoping they do not mind 🙂 ! You are the third to ask in two days: hope I’m not too unwelcome!! You’re container garden has yielded some great veggies . . . I love that you harvested your first potatoes. Thanks, PiP! Thanks for the update Piglet, I’ve realised that to grow veggies successfully one really has to be able to devote some time every day to the project. Sadly at the moment I don’t have that kind of time but I try and keep my herbs, rocket and lettuce going so that I at least have the pleasure of picking those fresh. One of these days …. You have quite a variety of veggies Carole. 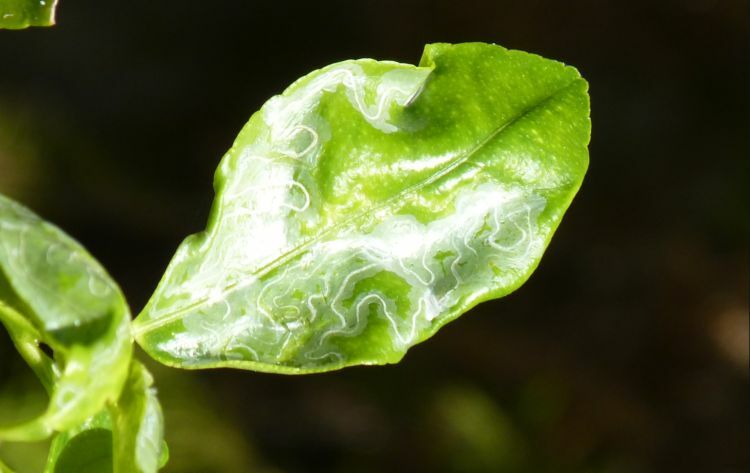 Sorry the leaf miner concoction didn´t work. Maybe it has to be caught right at the beginning. I never seem to have success with strawberries. My garden is also a haven for bugs, we have 4 huge kale plants now seeding, and at the moment it hardly has any leaves or they are full of hole – I keep on picking snails and black caterpillars out of it! Blasted bugs!! I’m going to try the leaf miner concoction again as I really do not want to use chemicals. there are lots of new shoots coming on the lime tree at the moment so I will at least see if I can save those. SAlt for the snail and washing up liquid for the caterpillars! Thanks Eliz, I don’t know about tossing pots but I’ve certainly tossed more than a few snails over the last few days. 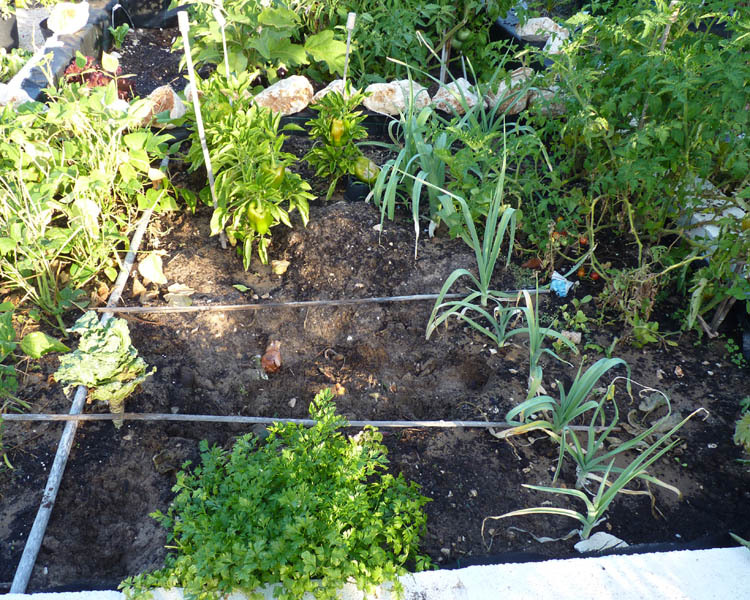 We got below freezing the other night, so my garden’s dead now…but I’m glad, because I’m gardened out for the year. I dried my tomatoes and they are yummy and still have my counter full of squash and tomatoes and watermelon I have to eat through before it goes bad. I’m ready for a nice chilly fall now and no work in the garden. Yea! Sorry about your bugs. I hate them. Hi Cahr, thanks for stopping by 🙂 there is a hidden benefit of having frost – it kills the bugs! How did you try your tomatoes? I tried it one year and they went as hard as bullets! Aha! A dehydrater, thanks Char for solving the mystery. I dried my cherry tomatoes in the sun. That’s how my grandma always did her fruit leather and apricots. But she was out there constantly turning them and checking them so they didn’t fizzle. Thought it was the lost experianc of not buddy blogging that make me want so tenderly and feel suddenly strongly about it. It’s your writing that does that to me. Your writing has an animal in it. One. Hiya Wayward 🙂 I’m not sure if my writing has animal in it , but I like studying animals, especially little piggies! Oh, it must be Piglet himself. You know the one The Te of Piglet is about. 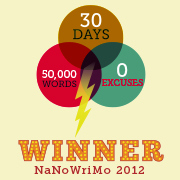 Yeah, there is animal in your writing, it’s emotion. connecting kinda stuff. Maybe some kinda unexpected WordPressWoodstack happens, err better. Our garden needs TLC, but we have been so busy! He is the parks and gardens type gardener, not too crash hot yet on veggies. Really though, it is because we didn’t know what some of the plants were, so we’re waiting to see. But it is out of control! I tired growing cucumbers and failed. They would not grow! Same story with other gourd varieties too! Great gardening tales! I hope someday I will have a green space of my own.